Can Peugeot revive brand Ambassador? It is possible, but it won't be easy. French auto giant Peugeot, a part of the PSA group, dished out Rs 80 crore and announced the purchase of 'Ambassador' on February 12 2017. The CK Birla group owned Hindustan Motors stopped production of the 'Ambassador' in 2014 and had permanently shut the plant. Why Peugeot bought the clinically dead brand is something yet to be disclosed by the company that has always aspired to have a significant stay in India. The four wheeler giant of the 70s and 80s was highly similar to the now defunct British car model 'Moris Oxford III'. The Ambassador did wonders during its peak, selling close to 6000 units, in the 1970s. A car manufacturer's dream in India even today. Eventually, as the fibre, aerodynamics and other synthetic beauties entered, the lacklustre Ambassador lost its charm, the sales needle dropped down and the company shut operations. afaqs! reached out to the industry to find out how challenging it would be for the French giant to revive the brand. Few linked with the revival of the Beetle think the task maybe difficult in India but the global doors might still be open. Here's see what they had to say when we asked: Can the brand be revived? I would suggest that Peugeot should look at the Enfield play book and adapt it for Ambassador. So retain the vintage looking exterior but completely change the interior. New engine, new suspension, new steering console but the same old interior space. This vehicle can be a nice car for long drives and the estate owners. Well, in the Indian context, it will be a tough task if you ask me. It represents a slower, comfort-mobility. In India, people are still excited about what's next, new innovations and the next level of technology. In the Ambassador's case, the mood of the category is such a ride on nostalgia and that makes it difficult to get people excited. At the same time, if marketed properly in the global markets there can be better returns. There is room there but in the Indian context to me it looks extremely difficult. In the case of the Beetle, if we remember the entry point was it being an economical solution. While the long tail expensive cars were grabbing eyeballs on road, here was a smaller economical alternative - the 'Beetle'. What is going to be the entry point of the Ambassador? I don't see Ambassador becoming the largest selling four wheeler again. The automobile sector has moved on since the time when Ambassador used to be the market leader. Having said so, Indians have had an emotional attachment with the brand. 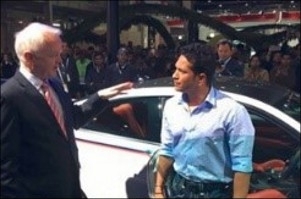 The real value of the Ambassador's revival could lie in the immense value it can add to the Peugeot brand as it will allow them to connect to the Indian audience emotionally when they relaunch themselves in the Indian market. In a fast moving world, there will always be some seeking old charm. Brands like the 'Beetle' have been revived, reinterpreted and their cult and legacy is built upon. Would love to see how this story evolves. Hindustan Motors failed to do with the Ambassador what Royal Enfield did with the Bullet. In the case of the Bullet, while the retro stance was kept intact, innovations were also roped in to make it relevant to the new generation. While the Ambassador got totally irrelevant and eventually defunct, I don't see anybody missing Ambassador in today's four wheeler market in India. So the revival in India would be an extremely tricky one for Peugeot, which itself too, does not have a lot of holdings in India at this stage. In the global markets, the story might be a little positive. Also, it would be interesting to see at what price point the brand comes back. The Ambassador was never known to be expensive and Peugeot, if it installs all modern technology, will have to increase the price too, and Indian consumers paying that high a price for the Ambassador is a little difficult, in my opinion. afaqs! Round Table Conference: "There's no bad car"